St Ives Food and Drink Festival . Held over two days in May. A celebration of the best of Cornish food and drink. Events including cooking demonstrations by the town's chefs, food tastings and wine tastings. 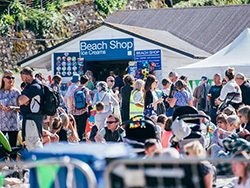 The festival takes place on the beautiful Porthminster Beach - with lovely views across St Ives Bay and lots of space to stretch out and enjoy the May sunshine. 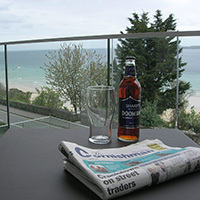 Luxury 5 star self catering in St Ives, Carbis Bay and Lelant. 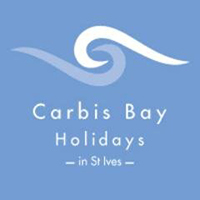 Carbis Bay Holidays specialise in luxury four and five star self catering holidays. 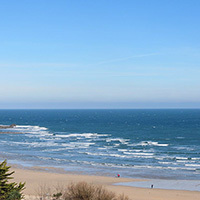 Whether your choice is a beachfront apartment for a family Cornish holiday, a romantic coastal retreat or an activity holiday to give you a blast of fresh, salty air, then look no further. Overlooking the sea with views out to the harbour. It also has a private parking space. Two bedrooms, one double ensuite and one twin. Open plan living and dining room with a modern, well-equipped kitchen. Also a large private balcony overlooking the sea. Sleeps: 4 in 2 bedrooms. Private Parking: Yes - on site. A calm beach retreat perched above Porthminster Beach. Enjoy the boutique style of a hotel with all the comfort and freedom of home. GOLD Award by Visit Britain. Private terrace with sweeping ocean and harbour views. A dedicated parking space right in front. 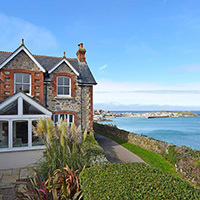 A beautiful 5-star Gold rated house in a spectacular coastal setting, with panoramic sea views extending across the whole of St Ives Bay. Outside you can enjoy the sub-tropical terraced garden just soaking up the sun and the seaside ambience, or tuck into a tasty supper on the dining patio. Sleeps: 8 in 4 bedrooms. High ceilings and panoramic views from the large bay window on the living room. 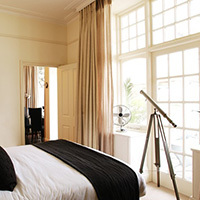 The balcony is off the master bedroom which has an en suite bathroom, window seat and fabulous views of the beach. The property has high specification fixtures and fittings and is perfect for couples and families. 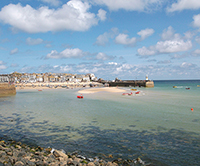 The Best St Ives Cornwall Website.